Wind, sun, rain, snow; they’re relentless, and your roof is your home’s first line of defense against the elements. No matter how strong, sturdy or reliable your roof is, it will show signs of wear-and-tear over time. Because roofing contractors can be costly, many homeowners end up finding out how to repair a roof on their own. Minor roof repairs are fairly easy to execute, so long as you’re not afraid of heights. 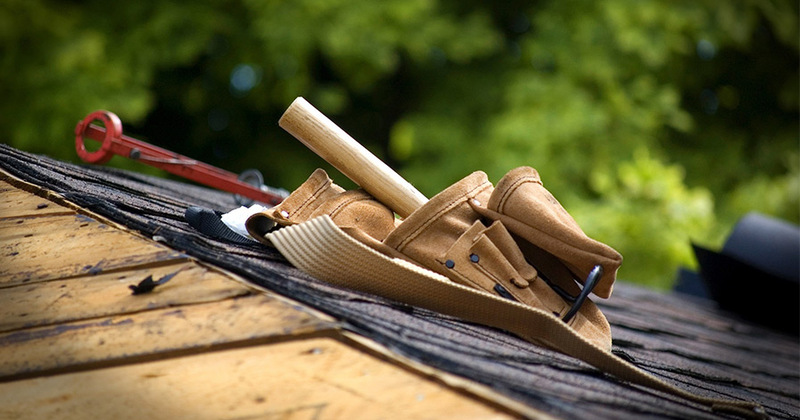 All you need is some basic knowledge about common roofing problems and a few simple tools and supplies. Damaged shingles. To fix broken roof shingles, you need to remove the damaged shingle by lifting its edges, prying the nails loose with a crowbar, then lifting the shingle off. Then, place the replacement shingle and hammer it into place. To make this easier, you can shave some excess material off the shingle’s corners to round its edges. Leaks. To fix a leak, you need to isolate the point at which the water is entering your home. Typically, leaks are the result of damaged, broken, warped or missing shingles. If it’s a problem with the roof itself, you can fill the crack with sealant, then replace whatever shingles need to be removed to access the site. Damaged vent pipes. Some leaks result from worn flashing around your vent pipes. To fix damaged vent pipes, you’ll first need to remove any shingles that are in the way so you can access the pipe. Then, pry the flashing off with a crowbar, fill the leaky spots with cement or sealant, then place the new flashing by placing it in the same position as the old flashing and securing it in place with roofing nails. Finally, replace any shingles you had to remove to access the leak. It is strongly recommended that you wear sturdy safety gloves to avoid cutting yourself on the sharp shards of metal you’ll have to handle. Clogged gutters. Regular gutter maintenance, ideally during the spring and again in the fall, is the best way to prevent serious problems. Simply get a plastic or metal scoop that’s narrow enough to fit, then go along your gutters and scoop out excess debris. If you have major problems, you may need a roof replacement. This is a much bigger task, and it may be worth investing in professional roofing services to ensure it gets done right. Professionally installed roofs also add a lot of value to your home, so in many cases, the investment pays for itself down the road.